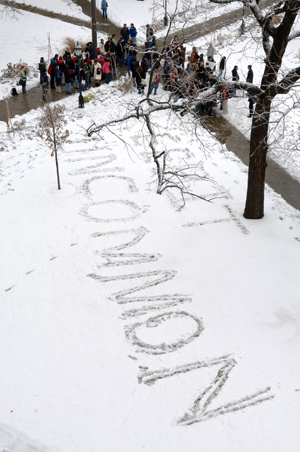 Mother Nature provided the canvas for the protesters’ “Keep it UnCommon” message on the quads. The display of school pride-—as one sign put it, “UChicago is a nerd haven”—came in response to news that the College is moving away from its distinctive UnCommon Application. While retaining its quirky essay questions as a required supplement, the University plans to accept basic information (names, schools, scores) submitted through the Common Application. Established in 1975, the Common Application has grown from a pilot program of 15 universities to nearly 300 member institutions, including Harvard, Brown, Northwestern, and a dozen public schools. When the change takes effect, either in 2008–09 or the following academic year, the Admissions Office will continue to make Chicago’s own form available and to use the term UnCommon in some way. Administrators hope the move will encourage more students, and particularly more diverse students, to consider the U of C. “Colleges using the Common Application claim that it helps them increase diversity,” said Vice President and Dean of College Enrollment Michael Behnke. “For instance, we know that the percentage of African American students using the Common Application exceeds the percentage of these students applying to the University.” According to Behnke, some 175,000 students used the Common Application in 2005–06, and nearly 300,000 are expected to file the form in 2006–07. Yet several of the 70 early responders to O’Neill’s post weren’t convinced. History major Deanna Day, AB’06, wrote that for her, a “first-generation applicant from a rural school,” Chicago was nevertheless an option. “Frankly, removing the UnCommon Application is insulting to those whom you’re trying to recruit. It sends a message to them that because their parents never went to college, the administration thinks that they’re incapable of filling out an extra form, or even of getting the joke.” Rather than changing the application process, she suggested, Chicago officials should advertise the school through more mailings and school visits. Perhaps what all this discussion represents, whether in the Maroon, online, or on the quads, is the uncommon nature of Chicago students. Protester Daniel Aguilar, ’07, noted that the quads gathering “says something about what U of C students are like, where they place their priorities, and what they want out of college.” Chicago students care about their school’s character, and they aren’t about to let the issue rest without debate.